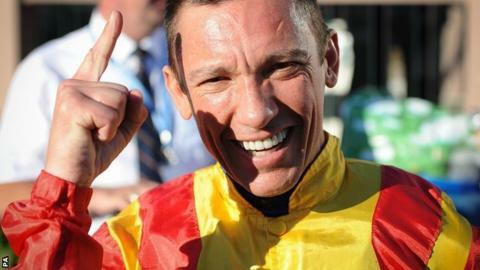 Snow Fairy, ridden by Frankie Dettori, earned her seventh Group One victory after winning the Irish Champion Stakes at Leopardstown. Ed Dunlop's mare, a 15-8 shot, outpaced British rival Nathaniel on the straight to win by a length and a quarter. Favourite Nathaniel, trained by John Gosden, led on the final bend before Snow Fairy took control. Earlier, former Golden Jubilee Stakes winner Society Rock defied odds of 10-1 to win Haydock's Betfred Sprint Cup. Snow Fairy now looks set to race in the Prix de l'Arc de Triomphe at Longchamp on 7 October, before taking on Frankel in Ascot's Champion Stakes two weeks later. Dunlop is also targeting November's Breeders' Cup in Los Angeles for his mare, who has only recently returned from a serious leg injury suffered when winning the Prix Jean Romanet at Deauville. "We've always said this year we will take each race at a time after the injury she has had," Dunlop said after the Leopardstown win. "She seems fine after the race, she's in the Arc, she's in the Champion Stakes - obviously Frankel is in that and that is a different level entirely. "We'll see. I've said before I'd like to go to the Breeders' Cup, she hasn't done that and I'd love to take her to America and maybe win in a sixth country." In a steady-paced race at Haydock, Kieren Fallon guided Society Rock to the front with one of the six furlongs remaining. And the James Fanshawe-trained five-year-old managed to hold off Gordon Lord Byron and Bated Breath, with pre-race favourite Ortensia finishing out of the top four. Society Rock's last victory came in the Group One Golden Jubilee Stakes at Ascot in 2011. Ortensia, winner of this year's Nunthorpe Stakes, looked lively but never managed to find an extra yard of pace to join the leaders.